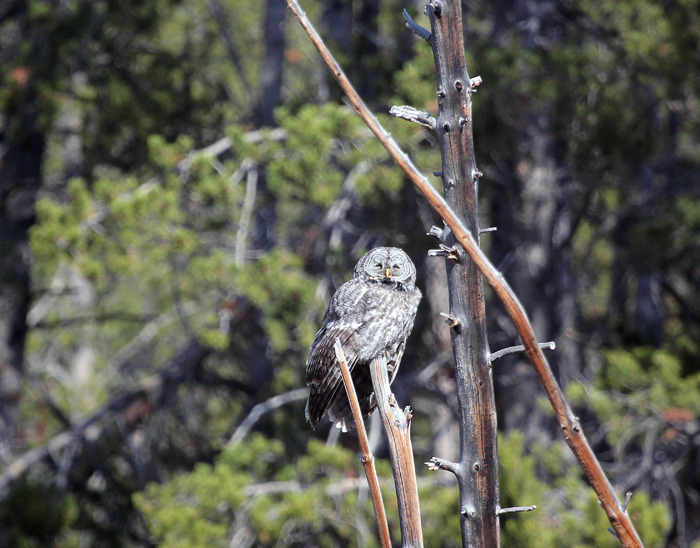 In September, the UCLA lab I work in took a trip to Yellowstone National Park. Our lab, the Robert Wayne lab, is a conservation genetics lab, specializing in dog and especially wolf genetics. Most of the lab members study domestic dog or wild dog species, such as grey wolves and Channel Island foxes. But just because people in our lab study these animals, it doesn't mean we are always around these animals! So, in order to see some wolves in action, we decided to take a trip to Yellowstone. 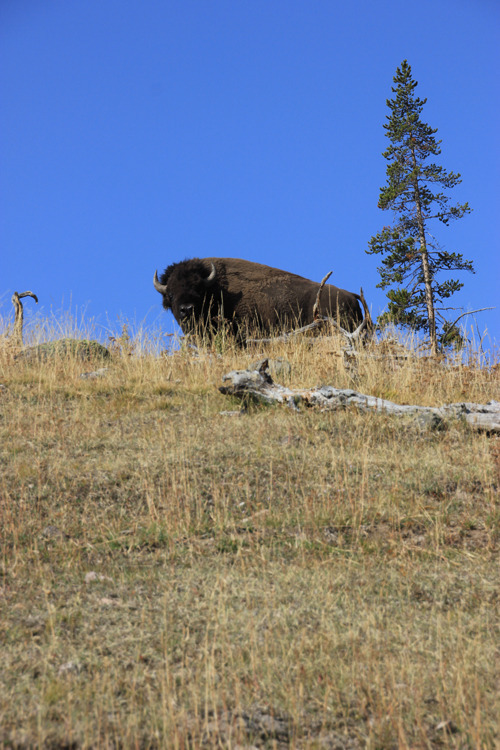 Given the expense of flying to the Yellowstone area, many of us drove the long 17-19 hours to the park. Once we got to Yellowstone, everyone in my car was excited to see some wildlife and take a nice long hike! Watching wolves in Yellowstone mostly involves a lot of driving around. In order to see them, you generally have to go to the open valley areas where, with binoculars or spotting scopes, you can observe them from a distance. To find them, you have to drive around to see if you can spot them- or spot the people that have already found them and are standing with binoculars and spotting scopes looking off in the distance. In the open valley areas, you don't have vegetation blocking the view. Wolves and other wild dogs are quite different than most wild cat species in that you can actually observe them! With wild cats, because they are elusive and solitary, it makes it difficult to find them, let alone observe them for an extended period of time. What's particularly amazing to me about the wolves in Yellowstone is that when they make a kill, it is sometimes possible to see them feeding on their kills. And their kills also attract other scavenging animals like grizzly bears, coyotes, and ravens to name a few. So if you are lucky to find a fresh kill close enough to the road, you may have the chance to see multiple species feeding and potentially interacting with each other. Unfortunately for us, we didn't see bears feeding on any kills, but we did see wolves, including wolf pups, feeding on a fresh kill they made. We also observed a coyote scavenging an older kill. The coyote we had the chance to see seemed almost nervous to scavenge the old wolf kill! Perhaps it was nervous to encounter any wolves potentially still on the kill. Beyond wolves and their kills, we did see other amazing things. We observed a coyote hunting for what appeared to be gophers (see photos in slideshow below). 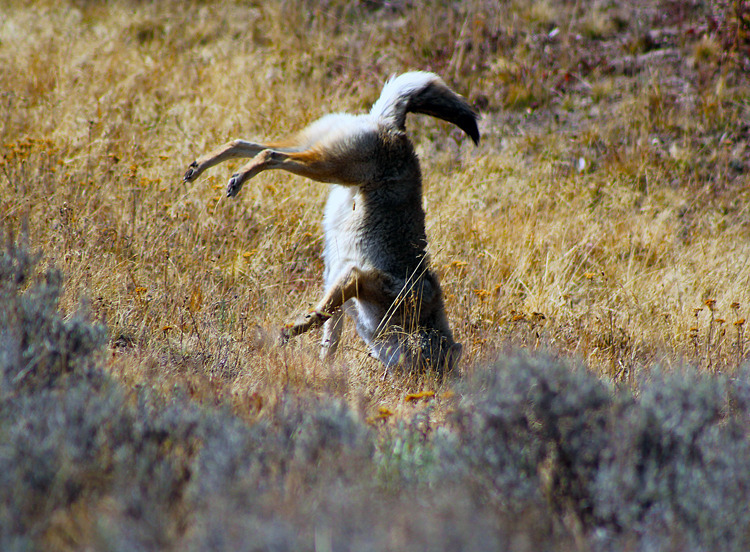 One thing that's interesting about the Yellowstone coyotes is they look vastly different from coyotes in the Santa Monica mountains! Their coats are a lighter grayish brown, rather than reddish brown. They are also larger and a little bulkier. This isn't surprising given the colder climate the coyotes face in Yellowstone vs. in the Santa Monica Mountains. The bulkiness of Yellowstone coyotes helps them survive the winters, and their coat color helps them blend in better with the Yellowstone environment. We also saw bald eagles, golden eagles, a big grizzly, tons of elk, and pronghorn antelope. 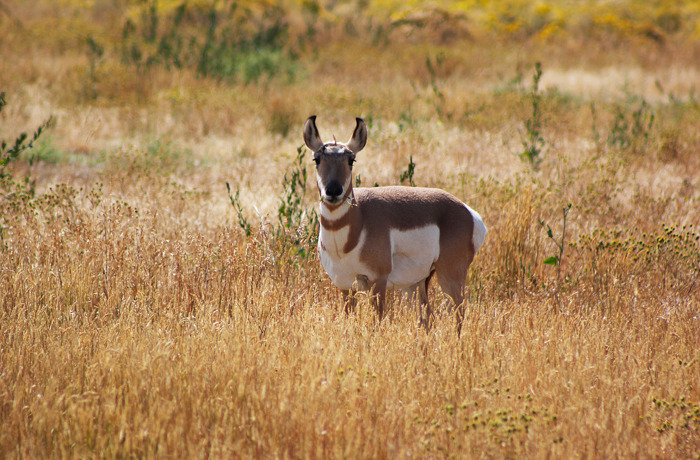 Pronghorn are really cool animals- they aren't true antelope, though the fill a similar ecological role as antelope in Africa. They are actually unique in that they are the only surviving members of the family (a type of classification for organisms) Antilocapridae. One cool thing about them though is that they are the fastest land mammal in North America and can run up to 65 miles per hour. They evolved their speed due to pressure from the now extinct North American cheetah that once roamed the plains of North America. The cheetah went extinct thousands of years ago, but the pronghorn remains. 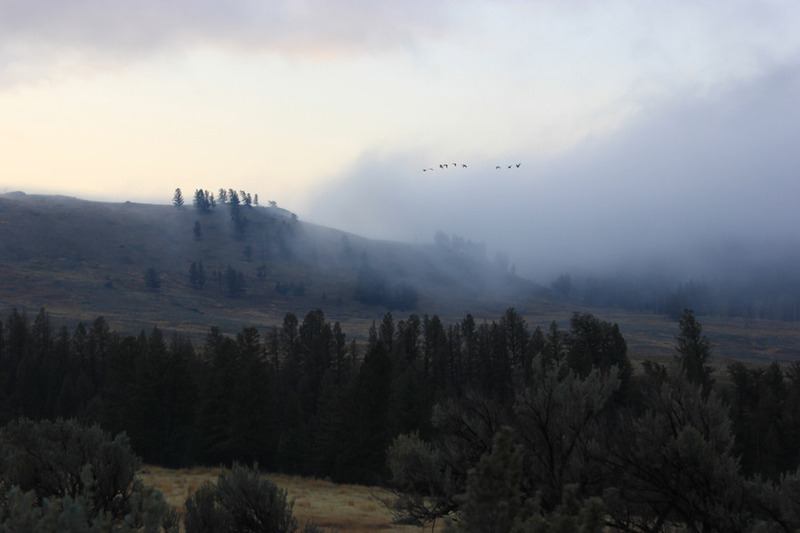 One other cool thing we observed was that we heard elk bugling- something the males do to attract the females. Since it the elk were in rut (the mating season), there were large harems of female cow elk, with males watching over and claiming them as his own! Overall, the Yellowstone trip was quite a success!